experimentation during model-fitting, particularly covariates to include, but also regarding data transformations/functional form. So we know p-hacking can be done. It is often listed as one of the "dangers of the p-value" and was mentioned in the ASA report on statistical significance, discussed here on Cross Validated, so we also know it's a Bad Thing. Although some dubious motivations and (particularly in the competition for academic publication) counterproductive incentives are obvious, I suspect it's hard to figure out quite why it's done, whether deliberate malpractice or simple ignorance. Someone reporting p-values from a stepwise regression (because they find stepwise procedures "produce good models", but aren't aware the purported p-values are invalidated) is in the latter camp, but the effect is still p-hacking under the last of my bullet points above. Is the effect particularly acute at the $p \approx 0.05$ boundary? Are similar effects seen at $p \approx 0.01$, for instance, or do we see whole ranges of p-values affected? 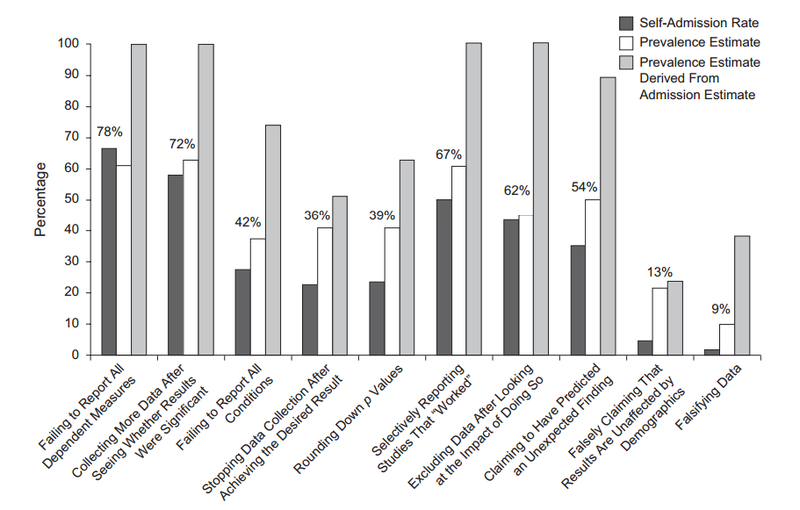 Do patterns in p-hacking vary between academic fields? Do we have any idea which of the mechanisms of p-hacking (some of which are listed in the bullet points above) are most common? Have some forms proven harder to detect than others because they are "better disguised"? Head, M. L., Holman, L., Lanfear, R., Kahn, A. T., & Jennions, M. D. (2015). 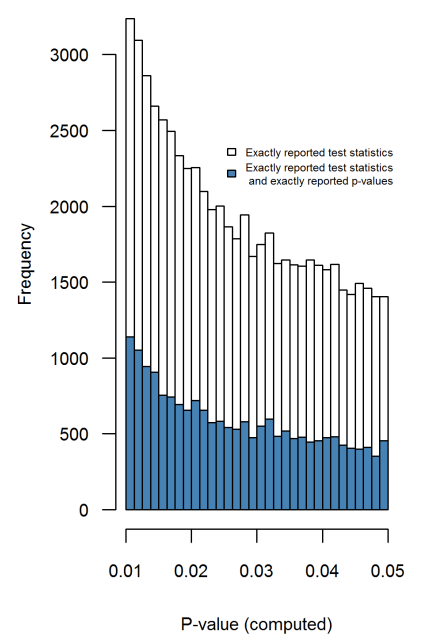 The extent and consequences of p-hacking in science. PLoS Biol, 13(3), e1002106. EXECUTIVE SUMMARY: if "p-hacking" is to be understood broadly a la Gelman's forking paths, the answer to how prevalent it is, is that it is almost universal. This problem is sometimes called “p-hacking” or “researcher degrees of freedom” (Simmons, Nelson, and Simonsohn, 2011). In a recent article, we spoke of “fishing expeditions [...]”. But we are starting to feel that the term “fishing” was unfortunate, in that it invokes an image of a researcher trying out comparison after comparison, throwing the line into the lake repeatedly until a fish is snagged. We have no reason to think that researchers regularly do that. We think the real story is that researchers can perform a reasonable analysis given their assumptions and their data, but had the data turned out differently, they could have done other analyses that were just as reasonable in those circumstances. We regret the spread of the terms “fishing” and “p-hacking” (and even “researcher degrees of freedom”) for two reasons: first, because when such terms are used to describe a study, there is the misleading implication that researchers were consciously trying out many different analyses on a single data set; and, second, because it can lead researchers who know they did not try out many different analyses to mistakenly think they are not so strongly subject to problems of researcher degrees of freedom. [...] Our key point here is that it is possible to have multiple potential comparisons, in the sense of a data analysis whose details are highly contingent on data, without the researcher performing any conscious procedure of fishing or examining multiple p-values. So: Gelman does not like the term p-hacking because it implies that the researches were actively cheating. Whereas the problems can occur simply because the researchers choose what test to perform/report after looking at the data, i.e. after doing some exploratory analysis. With some experience of working in biology, I can safely say that everybody does that. Everybody (myself included) collects some data with only vague a priori hypotheses, does extensive exploratory analysis, runs various significance tests, collects some more data, runs and re-runs the tests, and finally reports some $p$-values in the final manuscript. All of this is happening without actively cheating, doing dumb xkcd-jelly-beans-style cherry-picking, or consciously hacking anything. So if "p-hacking" is to be understood broadly a la Gelman's forking paths, the answer to how prevalent it is, is that it is almost universal. The only exceptions that come to mind are fully pre-registered replication studies in psychology or fully pre-registered medical trials. I have not heard about Head et al. study before, but have now spent some time looking through the surrounding literature. I have also taken a brief look at their raw data. I used $0.0001$ bin width, and one can clearly see a lot of predictable rounding in the reported $p$-values. Now, Head et al. do the following: they compare the number of $p$-values in the $(0.045, 0.5)$ interval and in the $(0.04, 0.045)$ interval; the former number turns out to be (significantly) larger and they take it as an evidence of $p$-hacking. If one squints, one can see it on my figure. I find this hugely unconvincing for one simple reason. Who wants to report their findings with $p=0.05$? Actually, many people seem to be doing exactly that, but still it appears natural to try to avoid this unsatisfactory border-line value and rather to report another significant digit, e.g. $p=0.048$ (unless of course it's $p=0.052$). So some excess of $p$-values close but not equal to $0.05$ can be explained by researcher's rounding preferences. And apart from that, the effect is tiny. Unless I missed something, Head et al. do not even discuss this potential alternative explanation. They do not present any histogram of the $p$-values either. There is a bunch of papers criticizing Head et al. In this unpublished manuscript Hartgerink argues that Head et al. should have included $p=0.04$ and $p=0.05$ in their comparison (and if they had, they would not have found their effect). I am not sure about that; it does not sound very convincing. It would be much better if we could somehow inspect the distribution of the "raw" $p$-values without any rounding. The difference is striking. The left histogram shows some weird stuff going on around $p=0.05$, but on the right one it is gone. This means that this weird stuff is due to people's preferences of reporting values around $p\approx 0.05$ and not due to $p$-hacking. This does look impressive, but Lakens 2015 (preprint) in a published Comment argues that this only appears impressive thanks to the misleading exponential fit. See also Lakens 2015, On the challenges of drawing conclusions from p-values just below 0.05 and references therein. Based on all of the above, my conclusion is that I don't see any strong evidence of $p$-hacking in $p$-value distributions across biological/psychological literature as a whole. There is plenty of evidence of selective reporting, publication bias, rounding $p$-values down to $0.05$ and other funny rounding effects, but I disagree with conclusions of Head et al. : there is no suspicious bump below $0.05$. If we want to know if researchers p-hack their results, we need to examine the p-values associated with their results, those they may want to p-hack in the first place. Samples, to be unbiased, must only include observations from the population of interest. Strong left skew suggests strong $p$-hacking. I would say that we know that there must be a lot of $p$-hacking going on, mostly of the Forking-Paths type that Gelman describes; probably to the extent that published $p$-values cannot really be taken at face value and should be "discounted" by the reader by some substantial fraction. However, this attitude seems to produce much more subtle effects than simply a bump in the overall $p$-values distribution just below $0.05$ and cannot really be detected by such a blunt analysis. Funnel plots have been a tremendous statistical innovation that turned meta analysis on its head. 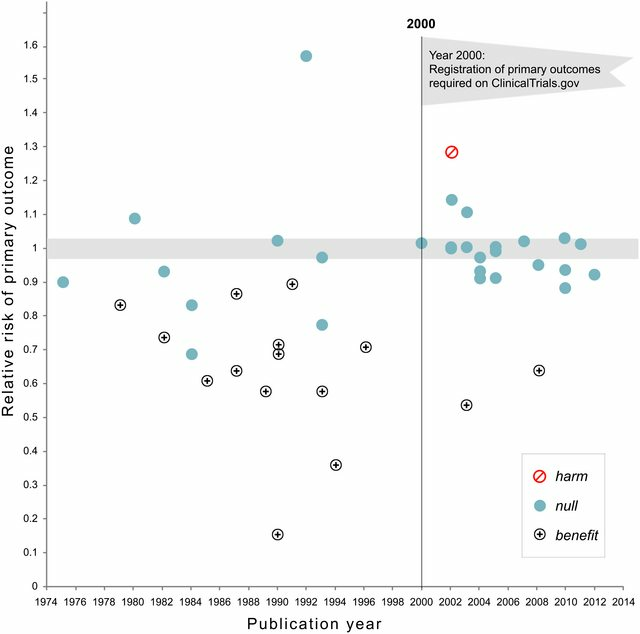 Basically, a funnel plot shows the clinical and statistical significance on the same plot. Ideally, they would form a funnel shape. However, several meta-analyses have produced funnel plots that show a strong bimodal shape, where investigators (or publishers) selectively withheld results that were null. The result is that the triangle becomes wider, because smaller, less powered studies used more drastic methods to "encourage" results to reach statistical significance. The Cochrane Report team has this to say about them. If there is bias, for example because smaller studies without statistically significant effects (shown as open circles in Figure 10.4.a, Panel A) remain unpublished, this will lead to an asymmetrical appearance of the funnel plot with a gap in a bottom corner of the graph (Panel B). In this situation the effect calculated in a meta-analysis will tend to overestimate the intervention effect (Egger 1997a, Villar 1997). The more pronounced the asymmetry, the more likely it is that the amount of bias will be substantial. The first plot shows a symmetrical plot in the absence of bias. The second shows an asymmetrical plot in the presence of reporting bias. The third shows an asymmetrical plot in the presence of bias because some smaller studies (open circles) are of lower methodological quality and therefore produce exaggerated intervention effect estimates. I suspect most authors are unaware of the methods they use to p-hack. They don't keep track of the overall number of models they fit, applying different exclusion criteria or opting for different adjustment variables each time. However, if I had to mandate a simple process, I would love to see the total number of models fit. That's not to say there might be legitimate reasons to rerun models, for instance we just ran through a Alzheimer's analysis not knowing ApoE had been collected in the sample. Egg on my face, we reran the models. Not the answer you're looking for? Browse other questions tagged hypothesis-testing statistical-significance p-value model-selection reproducible-research or ask your own question. Why is Binary Classification not a Hypothesis Test? Is stepwise elimination of insignifcant variables invalid if applied to experimental data? Does stepwise regression provide a biased estimate of population r-square? How much smaller can $p$ values from ANOVA's $F$-test be vs. those from multiple $t$-tests on the same data?